My vegetarian sister first introduced me to quinoa (pronounced Keen’-wah) some twenty years ago when this little known superfood was relegated to health food store shelves. Popular with vegetarians because it is a complete protein that is also rich in iron, calcium, phosphorus, magnesium, and fiber, this pantry staple is finding widespread fame thanks to its nutty flavor and ease of preparation. Quinoa is an ancient grain (well, technically it’s a seed but it is used like other whole grains) that was first cultivated by the Incas. In addition to its superfood qualities, quinoa is naturally gluten-free. Most quinoa recipes call for 15 to 20 minutes of cooking. Most recipes also call for a two-to-one ratio of liquid to quinoa. In my experience, these instructions often create an end result that is a bit mushy, so I do it a little differently. In general, I have found that many grains benefit from less water or broth than typically called for in package or recipe directions. This applies to quinoa and millet as well as brown and white rice. I call it “starving” the grain. Like pasta, these grains will continue to absorb water long after it is required to produce a good outcome. Anyone who has made soup with these ingredients knows that, if there are leftovers, there is often far less broth remaining after sitting in the refrigerator overnight! It is always good to rinse quinoa (then drain well) to eliminate a slightly bitter or soapy taste caused by quinoa’s natural coating of bitter-tasting saponins. If a package says the quinoa is pre-rinsed, it doesn’t hurt to do it again. Soaking, however, is not necessary. While there are said to be well over a thousand varieties of quinoa, the three most commonly seen varieties are white, red, and black. Occasionally, a blend of the three colors can be found on grocery store shelves. All taste basically the same and are prepared in the same manner. Sometimes people have reported a gritty texture to the cooked quinoa. In my experience, this is brand specific. I once purchased a bag that said to rinse and sort the quinoa before cooking–as is often instructed on a bag of dry beans to eliminate any pebbles or bits of dirt. If you experience this, try a different brand. Quinoa may absolutely be cooked ahead, cooled, and stored in the refrigerator for later use in salads and other recipes. Make sure to follow the cooking directions, fluffing before cooling and storing, to keep the grains light and separate. Perfectly cooked quinoa can be used as a base for delicious salads, breakfast porridges, pilafs–even baked goods and egg dishes. If cooking with broth instead of water, you may omit the salt. I do like to stick with water when preparing salads where I add a dressing later or when making a sweet or fruity recipe. A little oil or butter is a nice touch but may be omitted if you choose. Measure 1 cup of quinoa and 1 3/4 cups of water. Set the water aside. Place the quinoa in a fine-mesh strainer, and rinse thoroughly with cold water. I swish the quinoa around with my hand and sometimes plunge it (carefully, so the grains don’t float out!) into a bowl of water. The water should not appear cloudy. Drain very well. Add the liquid and oil (if using) to a medium-size pot and bring to a boil. Stir in the quinoa and the salt (if using) and return to a boil. Reduce the heat to maintain a gentle simmer and cook, covered, for 12 minutes. Check to make sure that most of the liquid has been absorbed. If it hasn’t been, cover, and let simmer for a couple more minutes. Once the liquid is almost completely absorbed, turn off the heat and remove the pot from the burner. Let stand for 5 minutes, covered, and then fluff the quinoa with a fork. You should see the germ–which look like tiny spirals–separating from and curling around the quinoa seeds. Serve immediately, as is, or in a recipe of choice. You may also cool and then cover and store in the refrigerator for later use. Cooked quinoa will keep in the fridge for about one week. 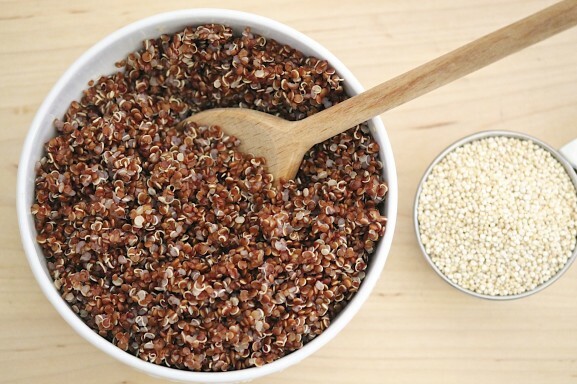 One cup of dried quinoa yields about 3 1/2 cups cooked. To impart a toasted flavor, you may first sauté the rinsed and very well drained quinoa over medium heat. Cook, stirring constantly, for about 5 minutes or until the liquid has evaporated and you begin to smell a nutty aroma. When toasting, check the final cooking time several minutes early; in this method, the quinoa is already in the pot when the water is added and brought to a boil, so it cooks slightly faster. 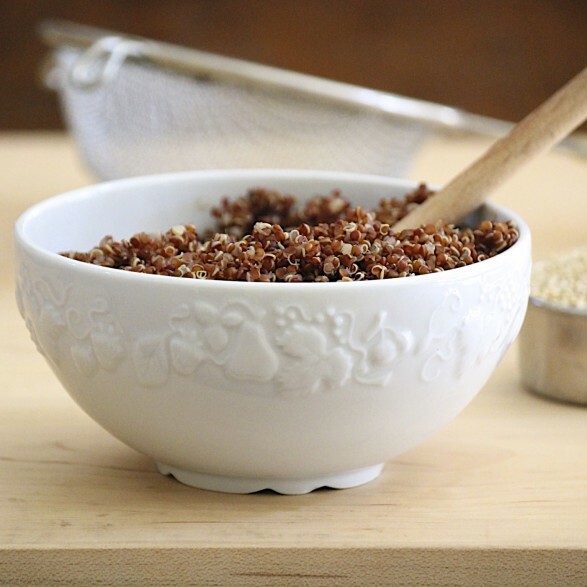 This method enhances the quinoa’s nutty flavor but, in the interest of time, I often skip this step and the quinoa still turns out beautifully. To quickly cool the cooked quinoa for use in salads, spread it on a baking sheet and refrigerate, uncovered, until cool. This also helps remove any excess moisture and separate the seeds. actually I have never rinsed it and never had a bitterness to it. an additional step I always follow instead is to toast the grains in the oil PRIOR to adding the water. toast til they pop, which brings out the nuttiness. Great point, Maria. Some brands are pre-rinsed, but I do recommend rinsing as not all are. I occasionally toast the quinoa…it does bring out an extra hint of nuttiness and is a great option. Thank you for your comment! I rinsed and rinsed to what I really felt was getting excessive and it still tastes like soap to me. I have also noted the price has gotten terrible. When i fist bought quinoa it was $.89 a lb. at my health food store. Now that is had become a trend I see it at $3.99 for a twelve ounce box in my grocery store. Hi Nana, Could the bag you purchased have gone bad? Quinoa is a seed, so it could take on a rancid flavor. As for the price, I have noticed that, too, and try to find it on sale. Maybe the store you bought yours from would refund you if you something is, in fact, wrong with your bag. Thank you so much. This recipe is the best! Wonderful, Paulette. So glad you like!